No, that is not a football match score. That is how the writer grades Norway’s transparency in regards to its Sovereign Wealth Fund in comparison to Singapore. This article is about the transparency of the Norway’s Government Pension Fund, not about the link between pension pay out and the investment returns of the GPF. 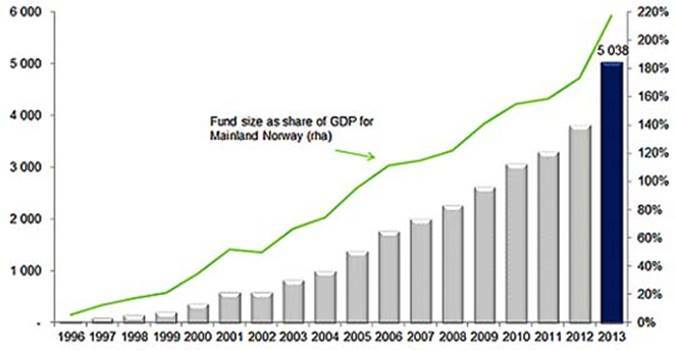 Norway operates a state pension system in which pension payouts are funded out of government budget. The GPF manages government reserves to smooth out the disruptive effect of oil prices and declining oil reserves on government finances and expenditures. *Norwegian central bank **the National Insurance Scheme ***the Norwegian Parliament. From this simple statement, one can already see that while the GPF manages the reserves, the reporting of GPF’s performance is done separately by the central bank and the National Insurance Scheme which manages the pension and health system. This is a clear separation of duties that is fundamental to transparency and compliance in finance and investments. In this aspect, Singapore is completely lacking. The poacher cannot be the gamekeeper. One can drill down to see performance for every single year. The GPF shows its returns net of management fees and adjusted for inflation to provide the real rate of return. In contrast, GIC and Temasek publish only their 5y, 10y and 20y nominal rates of return without taking into account inflation even though both stated that they aimed for a real rate of return target which is undisclosed. Although it is assume those nominal returns includes management fee paid, this is also not disclosed. While the GPF reports in Norwegian Kroner (NOK), GIC reports its returns in US$ which is meaningless to citizens and can only be viewed as obscuring its performance in the currency that matters, S$. In its long run performance, the GPF may seem under-performing Temasek (slightly better than GIC) but it must be noted that until 2009, the GPF’s investment risk is far more conservative and its returns went against the headwind of a very strong NOK. Since 2009, when the GPF adopted a more aggressive strategy, its return beats both GIC and Temasek. This speaks volume of its foresight in capturing opportunities thrown up by the GFC, again in stark contrast to both GIC and Temasek. The market value of the GPF is provided in the graph below. Please note Market Value measures changes in total fund value inclusive of retained earnings and inflows of new monies. The GPF shows the amount of new monies flowing in and also shows its return split into what the actual return is in foreign currency terms and what part the value of the NOK plays in deriving the total returns. So we can see that its superlative returns of 15.95% in 2013, 30% of which is due to a weak NOK. In contrast, Singaporean citizens cannot even tell what is the market value of GIC which is kept secret let alone what new monies or capital injection was delivered to both GIC and Temasek. Forget trying to determine how much the MAS exchange rate policy has cost to their rate of returns. The writer can go on and on but believed the point is made that Norway scored 8 goals against zero on a scale of 0 to 10. Why not 10? Well, the GPF does not disclose individual holdings only by geographical locations. This is understandable as the size of its portfolio (S$1.2t) meant some positions can cause market disruptions due to their size. If the GPF which is larger than MAS, GIC and Temasek combined, can be transparent despite its size, then there is no excuse for the poor disclosure in Singapore. Clearly the political culture of openness and accountability has everything to do with it. * Chris K holds a senior position in a global financial centre bigger than Singapore. He writes mostly on economic and financial matters to highlight misconceptions of economic policy in Singapore.